LASHKAR GAH, Afghanistan — As they have captured more territory in Afghanistan this year, the Taliban have twinned their military offensive with a publicity push. Their pitch goes something like this: We’ve learned the lessons from our time in power, and we’re ready to moderate a bit. At international conferences, delegates from the Taliban — infamous for outlawing girls’ schools during their rule from 1994 to 2001 — have made a point of being willing to meet and talk with female officials. Old hard-line stances against music and photography have been softening. But for insight into how the Taliban might rule if they succeed in holding large stretches of Afghanistan, consider Baghran district, in the southern province of Helmand. 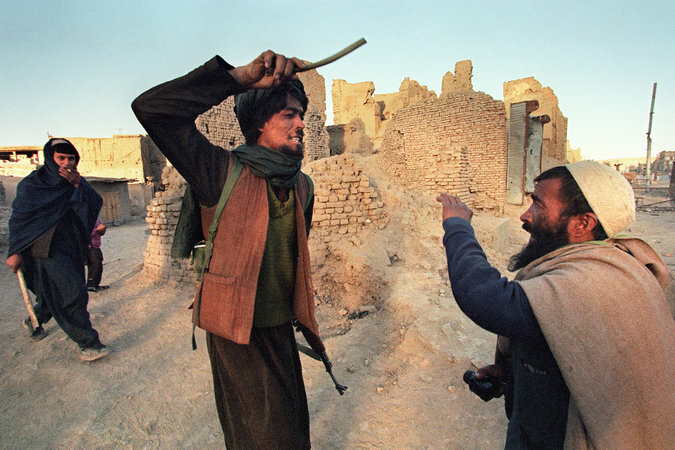 There, where the Taliban were scarcely ever out of power, the harsh old policies of the ’90s are still in full swing. Men are hauled into jail if they shave beards, and spot turban checks are still in place to expose any fancy haircuts. And there is still no freedom for women to travel or learn. The Taliban in Baghran are not an insurgent force but the government, and a long-established one at that. There is no cellphone service in Baghran, reflecting the Taliban’s wishes. Instead, people communicate with the outside world through a handful of “public call offices” — phones in stores near the bazaar. Through more than a dozen interviews with the men who answered these phone lines, as well as men standing nearby, a rare sketch of life in the Taliban’s most secure stronghold began to emerge. The New York Times also interviewed Baghran residents in person in Lashkar Gah, the provincial capital. There is probably nowhere else in Afghanistan more completely under Taliban rule. Officially, the Afghan government acknowledges having lost only four out of roughly 400 districts to the Taliban. Of these, Baghran was the first to fall, about a decade ago. But the Taliban’s rule has still proved attractive, or at least tolerable, to many rural Afghans who have endured decades of war. Residents of other parts of Helmand, who find themselves caught in the cross hairs of the war, have sought out Baghran’s relative security, migrating away from the front lines. “People are suffering under constant war, but we don’t suffer those kinds of problems,” said Hasti Khan, a farmer in Baghran. Some things have changed. Public executions, a feature of the Taliban’s national rule, were halted in Baghran in 2007 after an American airstrike killed a large number of Taliban fighters and residents who had assembled for one, residents recalled. But in most ways, the social restrictions that made the Taliban international pariahs during their reign have been resurrected in full in Baghran. Women leave home only with their husbands or male family members, and then only to visit a doctor or a few other authorized destinations. There are no girls’ schools, and education for boys is limited, too. The Taliban here converted schools to madrasas, which boys typically attend for perhaps three years before returning to family farms. The Ministry for the Promotion of Virtue and the Prevention of Vice, once famous for pummeling women who went out and men who played music, is back on patrol in Baghran. Vice-prevention officers often carry scissors so that they can deal, on the spot, with haircuts deemed excessively vain. Despite the rules, many in Baghran take a few risks, here and there, continuing to meet for card games. Radios are ubiquitous and tolerated for their news stations like BBC Pashto, Mashal radio and even Voice of America. “We are not supposed to listen to music, but sometimes when the Taliban are all inside we do listen to music,” one man in Baghran said. But Baghran’s main mud-brick prison often has 100 and sometimes twice that many transgressors, like Nazir Ahmad, 19, who served three days for his curly bangs. “It’s a style I like,” he said in an interview in Lashkar Gah, where he had come to find work. The Taliban, which have a robust propaganda arm and a news website featuring lengthy interviews with local commanders across Afghanistan, rarely talk about Baghran. That may be in part because of its importance in the insurgency’s lucrativenarcotics business. For years, it was home to an unusual concentration of heroin processing plants, so many, in fact, that they occasionally attracted Afghan military and counternarcotics raids. As the raids intensified, the Taliban ordered heroin production to move out of Baghran so as not to undermine security there, one local man explained. Baghran has not been entirely untouched by the war. Western and Afghan troops have occasionally conducted forays into Baghran, initially in search of Mullah Muhammad Omar, the Taliban’s supreme leader, who Western military officials suspected might have sought refuge there after his government was toppled in late 2001. Mullah Omar died more than two years ago in a Pakistani hospital, the Afghan government recently announced. The post-2001 Afghan government lost Baghran in a matter of three years. When a Taliban insurgency began to take shape, elders simply asked the 15 police officers in the province to quit and return home, recalled a tribal elder, Hajji Wali Mohammad, an uncle of one of those officers. With that, the Taliban became the dominant force. Some Taliban officials, particularly those sent to international conferences, have grown savvier during their long exile, and they suggest that the movement has grown more moderate. For example, the group no longer puts much effort into stamping out television or music recordings now that cellphones have become a fact of life across much of Afghanistan. Taliban-themed ringtones have become common. And the Taliban’s own propaganda wing, which provides battlefield videos and photographs of insurgent commanders and suicide bombers, makes a mockery of the old prohibition on photography and other depictions of the human form. Where the Taliban remain an insurgency competing with the government for the people’s loyalties, the group’s social restrictions do in fact appear to have mellowed slightly, particularly in the country’s north. Although the harsher ways have prevailed in Baghran, residents’ complaints often had less to do with the Taliban’s treatment of them than the deprivations that have taken hold: the lack of good doctors and the need to travel to other districts to buy staples, like cooking oil. And some said they were saddened by the lack of opportunities for their children, many of whom tend to work in the opium fields alongside their fathers. Many residents who were interviewed said they were mostly satisfied with the Taliban’s rule. Some agree with the Taliban’s principles, others have come to accept them. Not everyone, however, has been able to live simply. Ethnic Hazaras had been allowed relatively safe passage through Baghran, on several important market roads, in recent years. But over a month ago that suddenly changed: Hazara elders and other residents said that the Taliban’s district commander, Mullah Ghulam Hazrat Shahidmal, warned that Hazaras would no longer be allowed through, in what was seen as a troubling step back toward the targeting of minorities by the insurgents. His main responsibility is to occasionally remind others that the government lost Baghran long ago. He did so last year, when a new security adviser for Helmand Province complained that Mr. Rodi was not sending regular updates about the functioning of local government, like other district governors.